IT TAKES MORE THAN MONEY TO RESCUE SOMEONE. 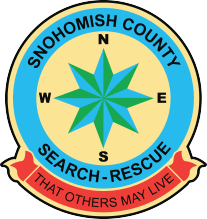 SCVSAR members answer the call to those in need in Snohomish County and beyond, 24 hours a day, 365 days a year. If you have strong interest in search and rescue we’d love to have you on board! There are many ways to serve, volunteers will only be asked to serve on missions that are good matches for their skill level and experience. The minimum age for membership throughout all of SCVSAR is 14 years old. Members aged 14-17 years must be accompanied on all SCVSAR activities by a parent or legal guardian, who must also be an “Active Status” SCVSAR member. Exception: Juvenile members involved in the ESAR Unit are provided direct adult supervision by ESAR leadership and therefore, the parent/legal guardian requirement is waived. Be physically fit enough to perform assigned tasks. Download a SCVSAR Prospective Member Packet containing required forms and complete information on training and skills assessment, equipment requirements, and member expectations. Complete enclosed forms and releases. Come to a unit meeting with your completed form and copy of your driver’s license or state ID. Snohomish County’s south county unit. Members respond to all county call-outs and serve on Special Operations Group. Provide technical rescue services in rugged mountain terrain. Joining EMRU involves a more detailed application process and requires technical climbing skills and experience. Search and rescue for 14-18 year olds. Volunteers learn basic outdoor and first aid skills and students can earn school community service credits. Snohomish County’s north county unit. Members respond to all county call-outs and serve on Special Operations Group. OSU provides command, coordination, communications, and hospitality assistance to SCVSAR, the Snohomish County Sheriff’s Office, and the Snohomish Country Department of Emergency Management. Snohomish County’s mid-county unit. Members respond to all county call-outs and serve on Special Operations Group. becoming a member of SCVSAR.